Vintage Style Tweed Amps-- Valvetrain Has 'em! Valvetrain's "Tortured Tweed" finishes have launched guitar amps into the relic fray. 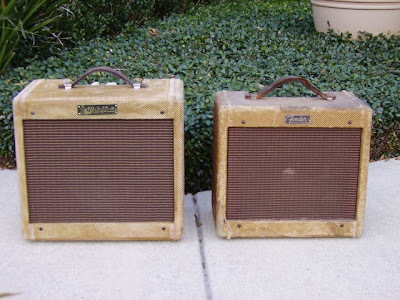 Pictured is a "new" Valvetrain model (left) next to an original 1950's Fender Champ. Valvetrain hand builds classic style amp models with high quality components, using point to point wiring. CLICK HERE for their better than average sound clips. Tortured Tweed is available in three levels of torture, similar to the Nash Guitars Timewarp Series relic guitar line (a coincidence per my research). "Run Hard and Hung Up to Dry"
Valvetrain also offers well over a dozen colorful and interesting tolex finishes, as well as a variety of beautiful dovetailed natural wood cabinet finishes, i.e. Cherry, Black Walnut & Mahogany. FAT TONE GUITARS (main site)- Fat Tone is also currently a dealer for NASH & K-Line guitars. Authorized Dealer for: Eastwood Guitars, Gretsch Guitars, Guild Guitars, Dean Guitars, St. Blues Guitars, Campbell American Guitars, Ampeg Amps, ValveTrain Amps, Peavey Amps, Genz Benz Amps, TC Electronic, Catalinbread, Toadworks, Subdecay, Keeley, MXR, Dunlop, Tech 21 and BBE Effects."